Skip Excuses, Find A Way! We Intuitively Know When Something Needs To Change In Our Lives; Something Needs To Shift. Self Healing begins with making change; shifting habits in our daily lives. Make the shift; create the change you need, you crave, now. Skip making more excuses. Change can be easy, change can be difficult. It is all in the way you approach change. New Year's resolutions are not something I recommend. They are usually "plans" made in desperation or out of guilt. Not exactly the energy needed to be behind real life empowering change. Real change is powerful. It has to come from the heart, mind, and soul. I can suggest everything you need to do to change your life, lose weight, lower blood pressure and cholesterol, and teach you habits that will invoke the self healing of your body. Change will happen only when you want it to happen and you make it happen. Instead of making resolutions at the eve or dawn of a new year, well because, you know something has got to give... how about finding what fires your passion and allow yourself to metamorphosis into the healing being you already are. Make lifetime lifestyle resolutions. 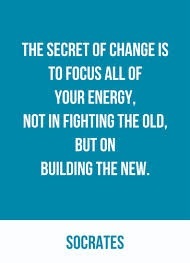 Create the change you want to see happen in you. Be the change, the healing energy, you innately are. I always tell them that everything in life is a choice. It is all just a choice. We can make up our minds to either continue the choice that is not serving our vibrant, juicy health OR we can chose differently. We can chose to create wellness in our every action, thought, and deed. The first step, towards overcoming any challenge is to acknowledge that we have a challenge. Not every challenge can be handled by a "professional", an expert in the field of our particular problem. When we are talking about the challenges of our own mind - body - soul, we need to grab hold of our life - our own problems, and take charge for our self and of our self. We are our own best expert! Seriously, who knows you better than you? Be the YOU expert. Step up to the plate and make the choice to make YOU happy and well. that are not feeding your higher self. LoveYOURSELF by inviting Vibrant Health Choices into your life.